Budgetainer. The best way to describe the new Lenovo IdeaPad Z580 might be “a mix of cheap and entertaining”. The plastic case includes a 15.6-inch screen, the latest connections, and attractive hardware. Our test model features the Core i5-3210M and an Nvidia GeForce GT 630M, corresponding to the middle of the pack in terms of both price and performance. 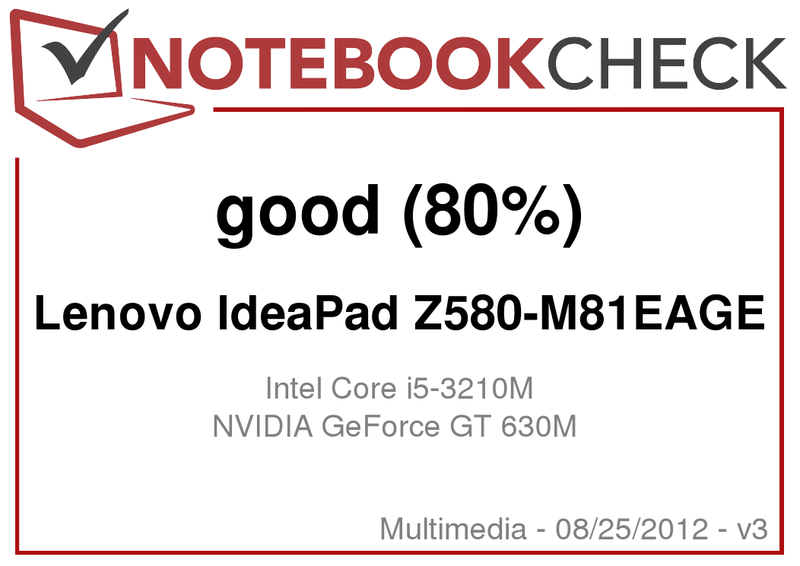 As a mid-ranged multimedia notebook priced in the 600 to 800 Euro (~$750 to $1000) range, the Lenovo IdeaPad Z580 competes in a contested product field which is served by almost all notebook manufacturers. The Chinese manufacturer offers many configurations capable of covering many divergent needs for the multimedia sector. Between the basic model with a dual-core CPU and a DVD drive and the top-of-the-line configuration with a potent quad-core processor and Blu-ray drive, our sample M81EAGE configuration represents the middle-class model of the series. A constant in all configurations is a 15.6-inch glossy, glare-type 1366x768 display. Our test model came equipped with an Intel Core i5-3210M dual-core processor from the current Ivy Bridge family, an Nvidia GeForce GT 630M with 2 GB of GDDR3 memory, 8 GB RAM, and a 1 TB hard drive. Other features include a 720p webcam, a 6-cell battery for mobility, and a keyboard with a dedicated numeric keypad. 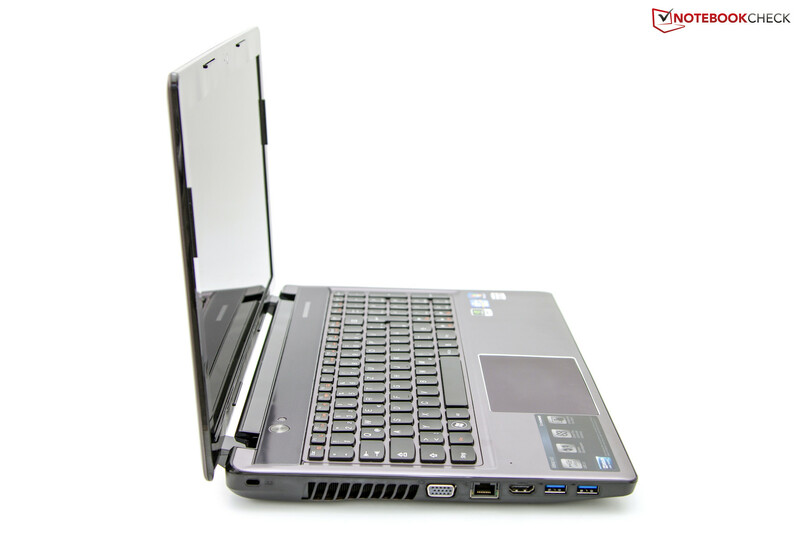 The notebook can be optionally configured with an Intel Core i7-3612QM and an Nvidia GeForce GT 640M. In this review, we will consider how our 699 Euro (~$875) test model compares to competitors, some of which feature faster components. An average case with an aluminum look. Visually, the Lenovo IdeaPad Z580 differs only slightly from the Lenovo IdeaPad Y580 of which we previously tested the US version. The charcoal and gray color scheme is pleasing at first glance. While the plastic surfaces imitate the look of brushed aluminum, the haptics and feel of the material differs. Furthermore, there is a more conspicuous red version of the Z580 which may be preferable depending on taste. All in all, most of the surfaces are glossy and fingerprints accumulate easily and are rather visible. The display cover is no exception. The workmanship left a good impression but transitions were sharp and definitely noticeable to the touch. As well, stability was not perfect. Under higher pressures, the wrist rest and keyboard depress. The screen visibly yielded under pressure and distortions were obvious. The display hinges, on the other hand, were tight and could be opened up to 135 degrees. It is worth mentioning that the tightness of the hinges caused the entire base unit to lift at times and might make working in a car or on a train difficult. The notebook’s total weight of 2.44 kg (5.37 pounds) is not atypical for this class but some other multimedia notebooks are slimmer and lighter. One example of this is the new Apple MacBook Pro with Retina Display which carries a very significant price increase. This is quite literally a comparison of Apples and oranges. 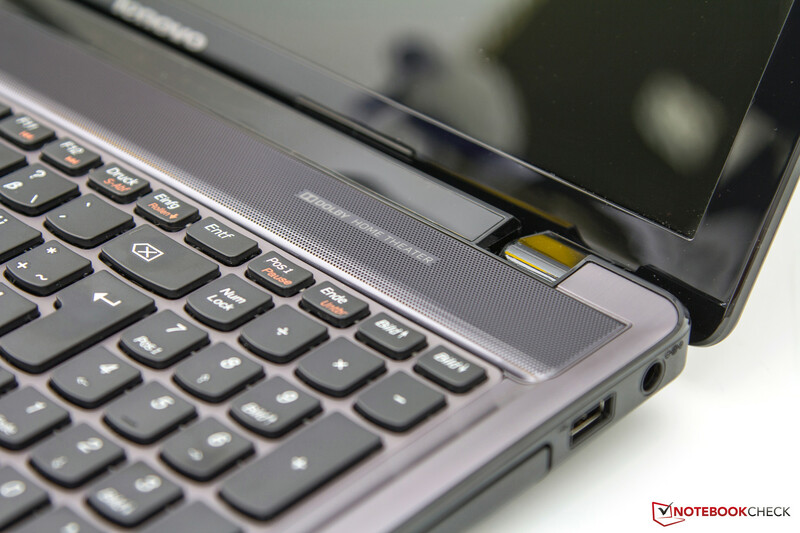 The Lenovo IdeaPad Z580’s connectivity is up-to-date for a device of its class. 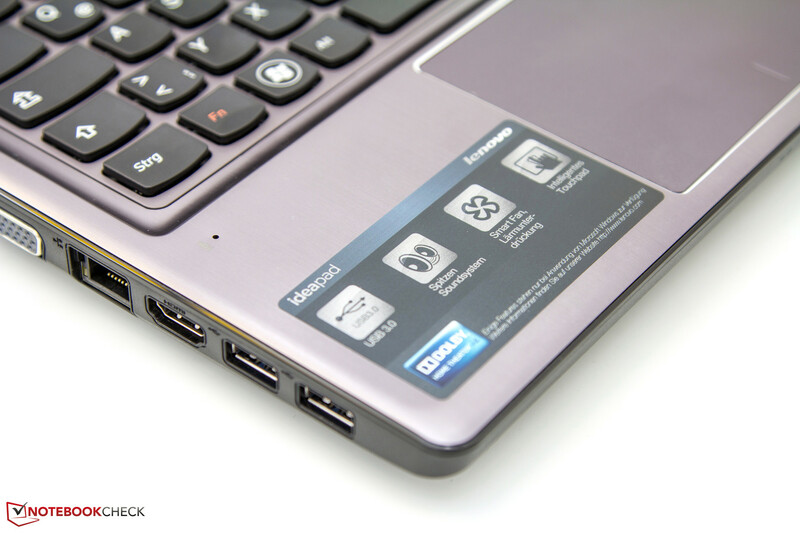 A total of four USB ports are provided, two of which use the latest USB 3.0 standard. Other features include an HDMI port, a card reader on the front edge, and two audio ports. Our test model also features a DVD drive. By comparison, the higher-price configurations of the IdeaPad Z580 use a Blu-ray drive for High-Definition movies. With the exception of the card reader, the positioning of the ports is limited to the left and right sides of the case. We found that the distribution and spacing of the ports could have been handled better, especially on the right side of the notebook where audio cables or an externally connected USB 2.0 device could hinder the use of an external mouse. 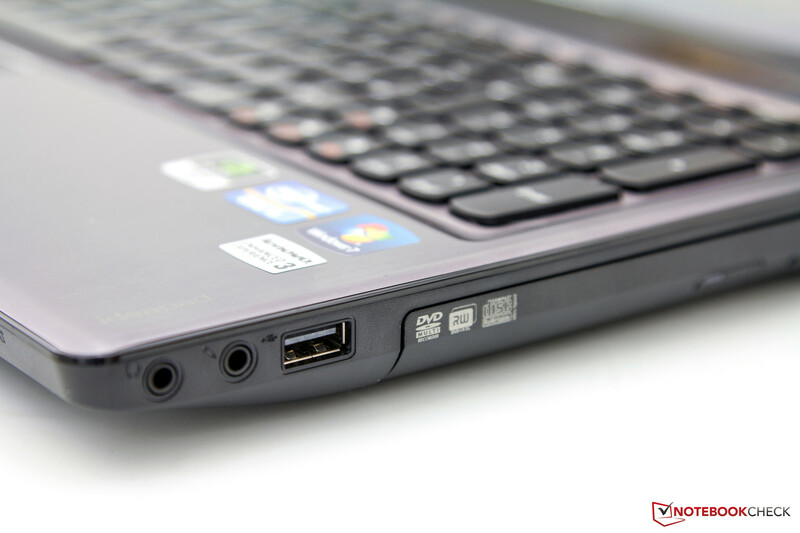 We found the IdeaPad Z580 more or less sufficient in terms of communications. Wireless features are provided by the Intel Centrino Wireless-N 2200 module. This module supports both IEEE 802.11b/g/n Wi-Fi standards and Bluetooth version 4.0 for short-range wireless communications. Unfortunately, the wired network connection only supports the 10/100 Mbit/s Fast Ethernet standard and this limitation is a potential weakness. For video calls, our sample notebook managed acceptable image quality from its 720p webcam and corresponding 1-megapixel resolution. In low-light situations, we found the use of an external high-quality webcam, such as the Microsoft HD 6000 and Logitech C910, to be preferable. 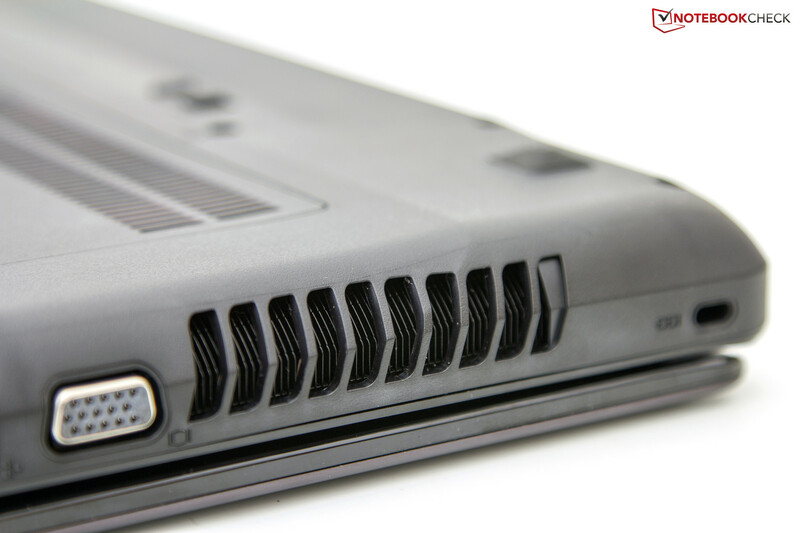 The IdeaPad Z580 includes a minimal amount of accessories. Beside the device itself, Lenovo provides a 6-cell battery, a power adapter and cable, and some printed documentation. Additionally, the notebook does not include recovery media or a recovery partition. Creating a recoverable backup requires the user to use the pre-installed OneKey Recovery 7.0 software suite. The notebook also comes pre-installed with Adobe Reader X, Dolby Home Theater software, Microsoft Office 2010 Starter Edition, and a time-limited McAfee Internet Security suite. The latter proved to be particularly annoying due to numerous and repeated pop-up windows which suggested upgrading to the full version. 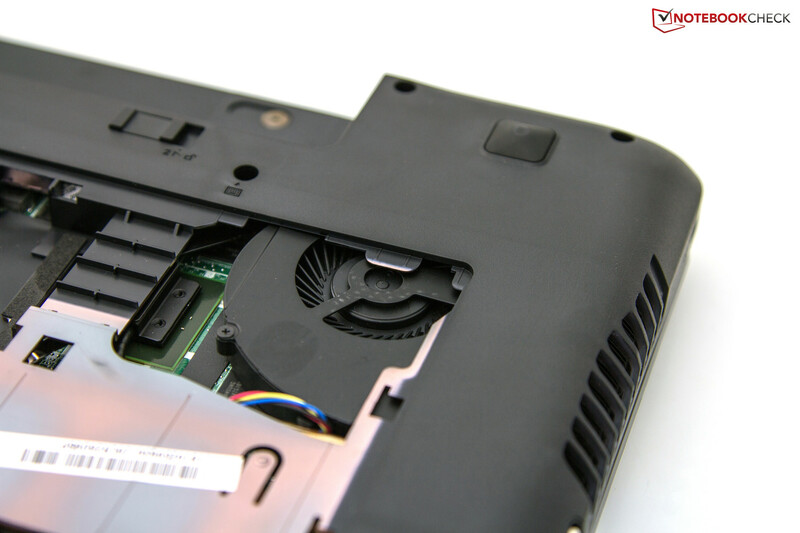 The underside of the IdeaPad Z580 houses a large maintenance cover that can be easily accessed after removing just one screw. Hidden by the cover are two banks of DDR3 memory modules, the 2.5-inch hard drive with a 9.5-mm (0.37-inch) build height, and the case fan. However, the fan is partially covered by non-removable components and cannot be cleaned completely. Doing so would require removal of the entire bottom panel. 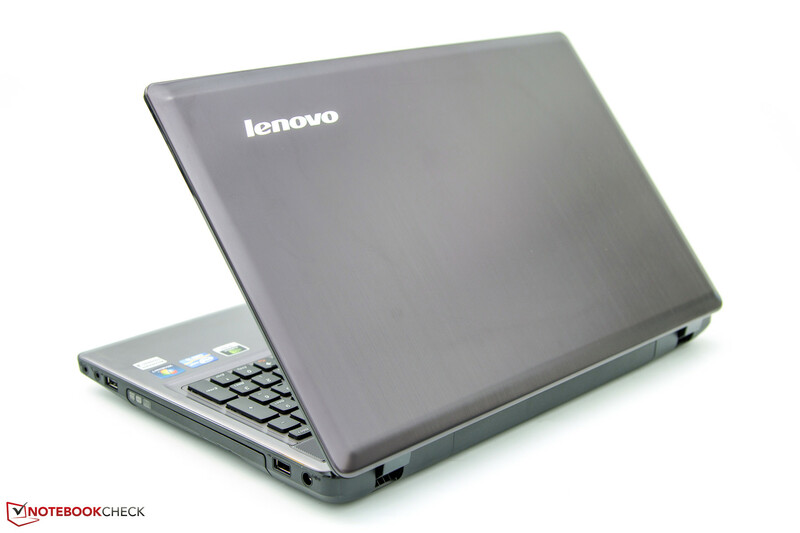 The Lenovo IdeaPad Z580 includes a 12-month warranty. While this duration is appropriate for a notebook in this price range, there remains room for improvement. Some manufacturers of devices in this segment offer a 24-month warranty at no extra charge. Lenovo also offers upgrade packages that extend the warranty to up to 36 months with on-site service but pricing for these could not be found on its website. 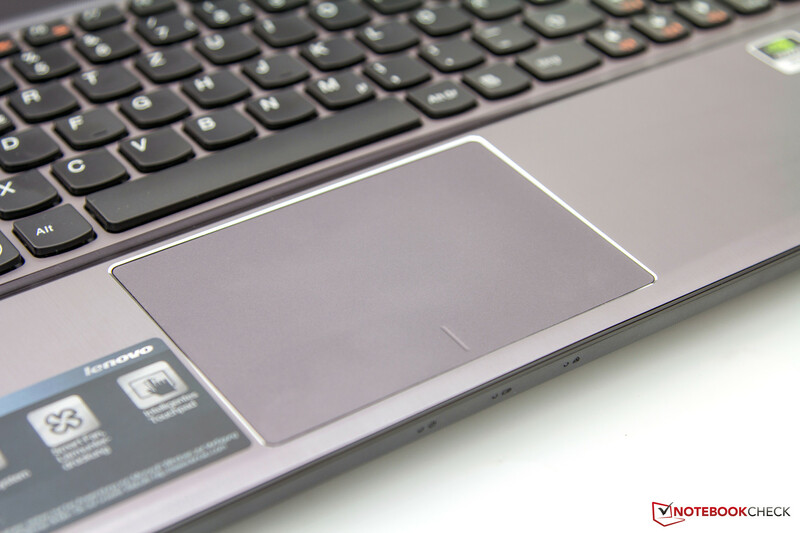 The IdeaPad Z580 uses input devices that are only slightly different from those of the previously reviewed Lenovo IdeaPad Y580. 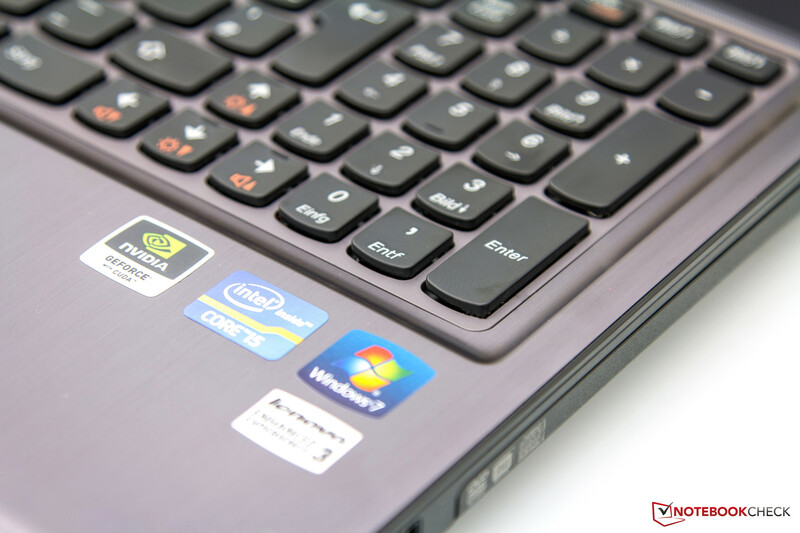 In our review of the IdeaPad Y580, we used a model with a backlit keyboard using the US layout. Our sample IdeaPad Z580 does not include this feature. Lenovo markets its slightly-rounded, island-style keyboard under the name “AccuType” and uses this design for virtually all notebooks. We found the keys’ feedback to be fine but their shorter stroke required some getting used to. The small shift keys and busy layout in the right third of the keyboard could also be improved. The dedicated numeric keypad of this device is potentially unnecessary. 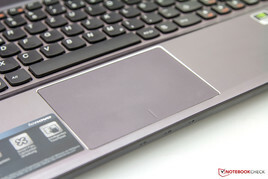 The touchpad is identical to that of the IdeaPad Y580. While slightly off center, the touchpad has an adequate size. The slightly matte plastic surface provided a good feel but the gliding properties were imperfect. More information about the input device can be found in our review of the Lenovo IdeaPad Y580 gaming notebook. 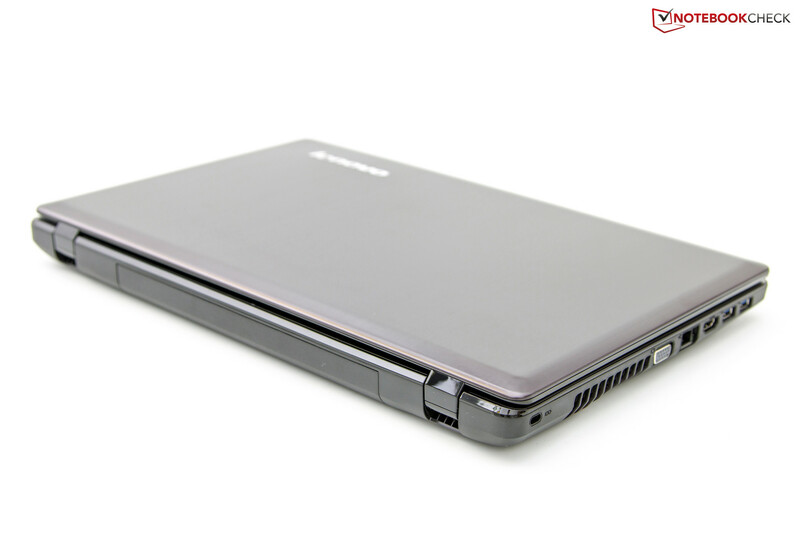 The Lenovo IdeaPad Z580 uses a glossy 15.6-inch Samsung SEC4252 1366x768 display in the 16:9 aspect ratio. This combination corresponds to the typical standard for most multimedia notebooks. More expensive alternatives typically use a Full HD 1920x1080 display which would be desirable for those choosing the IdeaPad Z580 with a Blu-ray drive. However, the inclusion of a Full HD display would likely increase the price beyond the targeted range for the entire IdeaPad Z580 series. Alternatively, one might use the HDMI or VGA output to drive an external monitor. In this regard, we found that the transmission quality left nothing to be desired. To test the technical aspects of the display, we used the Gossen Mavo Monitor tool. We observed a maximum brightness of 233 cd/m2 which places the display in the middle of the pack. The measured 212 cd/m2 average brightness and 85 percent illumination confirm this assessment. We also measured a black level of 1.57 cd/m2 which is simply too high. As a result, deep blacks could not be reproduced by the display. On the other hand, contrast ratio was decent. These traits were particularly noticeable when watching movies. Overall, we felt that the colors were well represented and at an appropriate level of sharpness. 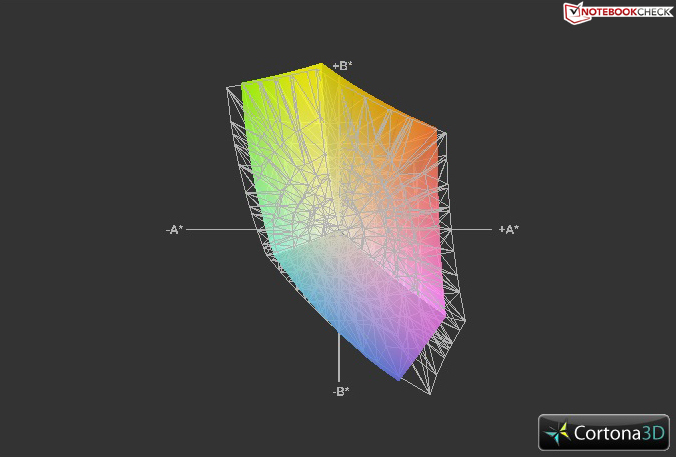 However, our measurements indicated that the display is insufficient for full reproduction of the sRGB color space. Compared to similar devices, this is only a marginal difference. In outdoor use, the combination of unspectacular brightness and glossy screen surface became rather noticeable. While working outside might still be possible in the shade where the screen occasionally displayed annoying reflections, direct sunlight made outdoor use virtually impossible. A matte screen would have been a nice option for this scenario. We observed viewing angles that confirmed the notion that the 15.6-inch Samsung screen is merely an average display. While display contents remained more or less stable even at low horizontal angles where the primary point of criticism was a brightness reduction, even minor deviations in the vertical axis caused color inversion. For this reason, one is likely to choose a TV over the IdeaPad Z580 for sharing movies with friends. 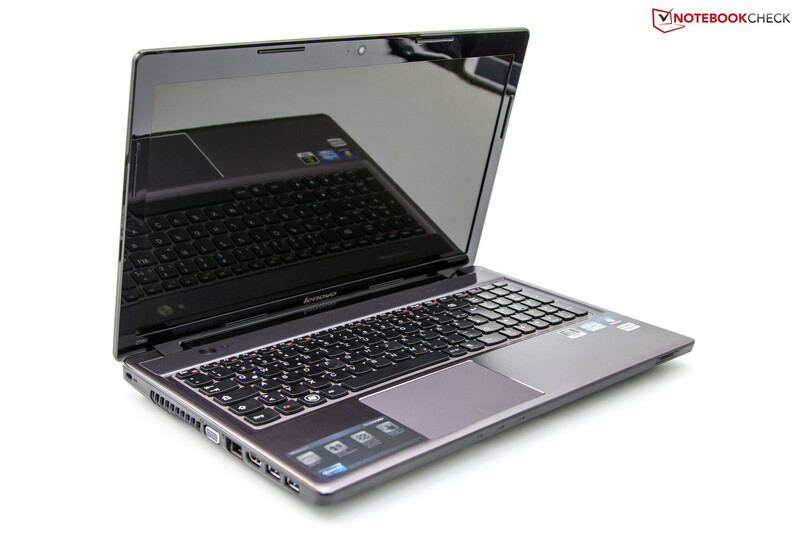 The Lenovo IdeaPad Z580 M81EAGE uses an up-to-date Ivy Bridge Intel Core i5-3210M dual-core processor. This processor has a base clock of 2.5 GHz for its two cores and is capable of handling four threads simultaneously. Due to Turbo Boost 2.0 technology, the processor is capable of speeds up to 2.9 GHz for dual-core operation and 3.1 GHz for single-core operation. The counterpart, Intel SpeedStep technology, allows the processor to excel in low-power operation as well. During low-demand scenarios, this processor operates at only 800 MHz. As a member of the Ivy Bridge family, the processor also includes the CPU-integrated Intel HD Graphics 4000. For those unfamiliar with this widespread integrated graphics solution, please consult our Intel HD Graphics 4000 benchmark article. Apart from the processor, the most critical component of the IdeaPad Z580 is the Nvidia GeForce GT 630M dedicated graphics card with 2 GB GDDR3 memory and support for DirectX 11. Nvidia Optimus technology allows the system to dynamically change between the processor-integrated graphics card for everyday tasks and the GT 630M for more demanding 3D applications without the need for an annoying system restart. 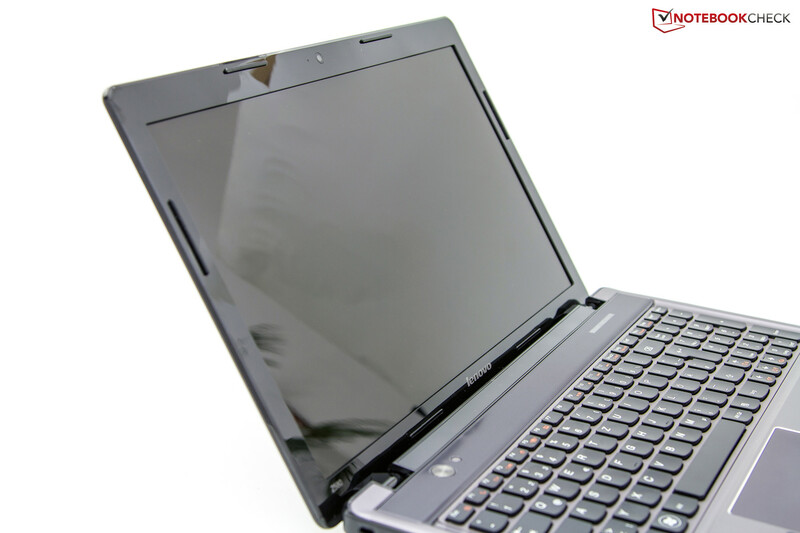 The notebook’s configuration is rounded out by 8 GB of Sharetronic DDR3 memory and a 2.5-inch 1 TB hard drive. Lenovo also offers other options and configurations that may increase or decrease the notebook’s overall price. 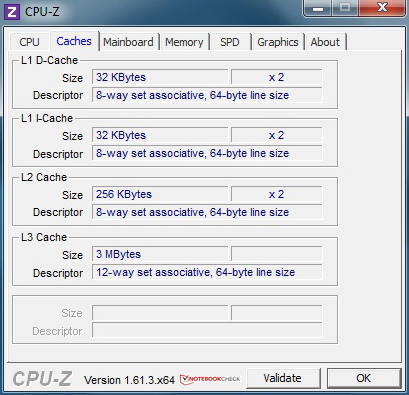 Information regarding possible components and configurations can be found on the Lenovo Z580 datasheet. For reviewing any processor, we start with CPU benchmarks. We used the popular Cinebench R11.5 test suite to analyze the CPU’s performance. 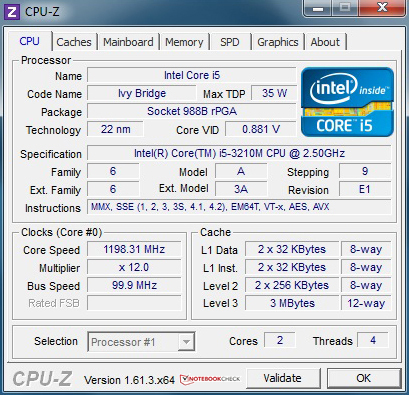 In the multi-threaded CPU test, the IdeaPad Z580’s Intel Core i5-3210M achieved a modest score of 2.88 points. The IdeaPad Z580 can also be configured to use a high-performance Intel Core i7-3612QM processor, making the IdeaPad Z580 competitive with other notebooks such as the MSI GE70 and Lenovo IdeaPad Y580. Of course, this also raises the question of economics as there is a significant premium attached to upgrading the processor. By comparison, the Dell XPS 15 which uses the aforementioned i7-3612QM and the Nvidia GeForce GT 640M achieved a score of 5.59 points in the same benchmark. The 94-percent performance difference is considerable. For those seeking to use the IdeaPad Z580 primarily for surfing the Web or watching movies, a dual-core processor should be adequate and the 100-Euro (~$125) premium could be used for accessories or other options. Of course, specifications alone do not sell notebooks. The performance of the specified components is also an important factor. As part of our review, we used the Futuremark series of system benchmarks. 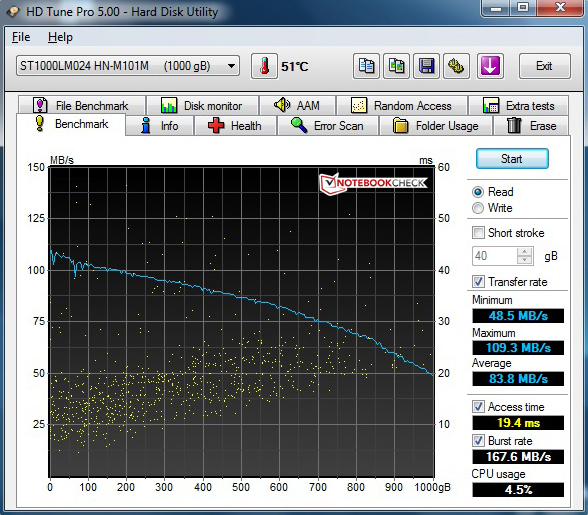 In PCMark 7, the IdeaPad Z580 achieved a total score of 2079 points. This places the notebook toward the middle of our benchmark database. 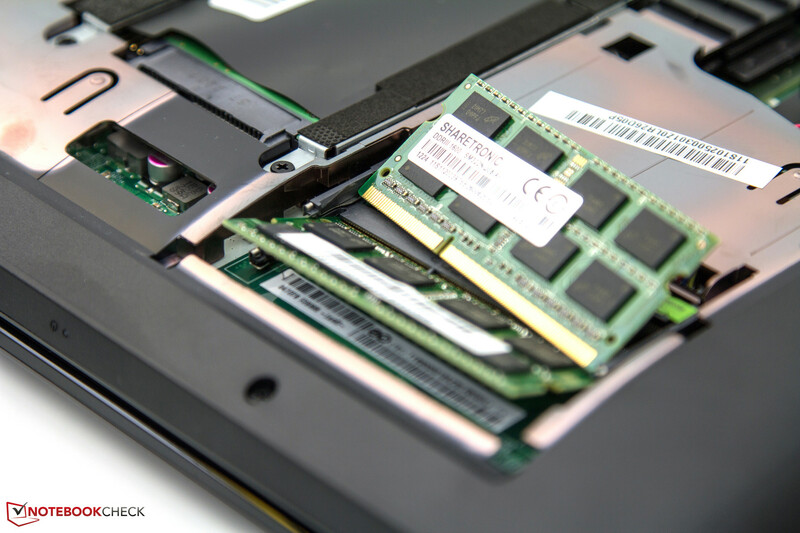 The use of a physical hard disk prevented a higher rating as the quicker access times and higher transfer rates of a solid state drive significantly affect a system’s scores in PCMark 7. For example, the Dell XPS 14 achieved a score of 3467 points, an increase of 67 percent, despite having the same graphics processor through the use of the fast Samsung 830 SSD. Nonetheless, the performance of the IdeaPad Z580 left a mostly positive impression in everyday use. Applications loaded fairly quickly and we did not observe long loading times. 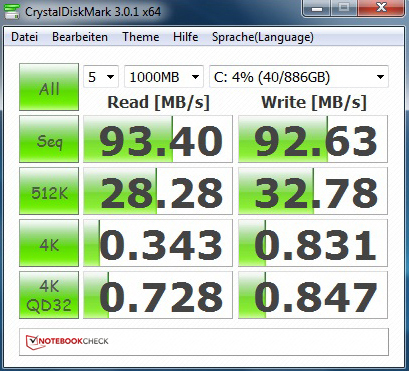 Only in direct comparison with SSD-based notebooks were load times noticeable. On average, the IdeaPad Z580 required 40 seconds for a system boot and between 30 and 50 seconds for Windows to load all necessary programs. Reducing the number of programs that start with Windows may help reduce overall system restart times. 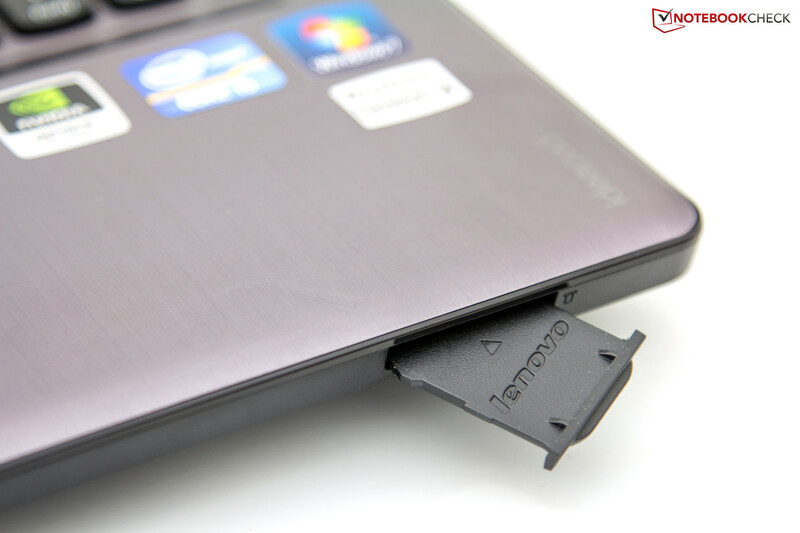 The Lenovo IdeaPad Z580 can be configured with storage solutions in capacities of 320, 500, 750, and 1000 GB. The largest option is the ST1000LM024, formerly made by Samsung. In 2011, the South Korean semiconductor manufacturer sold its hard drive division to Seagate. As a result, the formal naming of our IdeaPad Z580’s hard drive is the Seagate Samsung Spinpoint M8. This 2.5-inch drive operates at 5400 RPM and is accordingly not the fastest physical drive solution. We measured average sequential transfer rates of 90 MB/s at increased access times using AS SSD. Lenovo currently offers no quicker hard drive options. 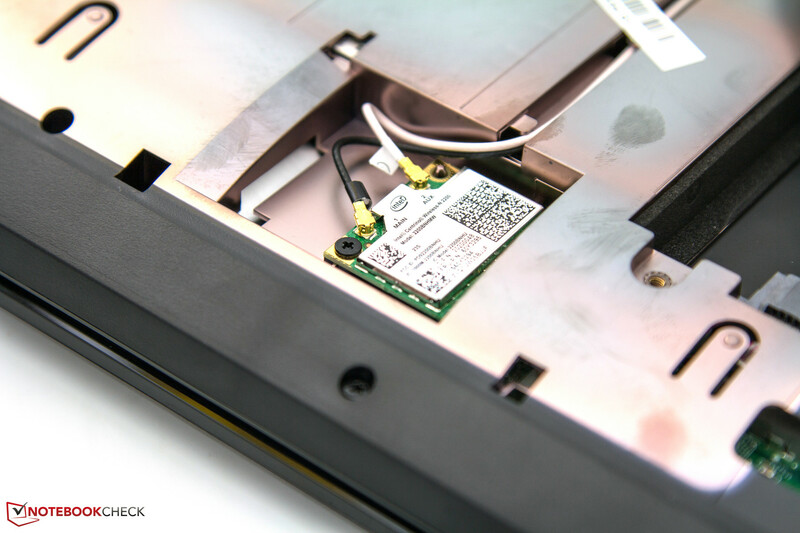 It is possible for even inexperienced end-users to replace the drive with an SSD using the SATA III interface. The Lenovo IdeaPad Z580 features the Nvidia GeForce GT 630M which seems to be ideal for multimedia applications based on its 2 GB GDDR3 memory and a core clock speed of 660 MHz. In order to test the performance of this graphics card, we used Futuremark’s synthetic 3D benchmarks. Starting with 3DMark06, the GPU achieved a score of 7948 points which falls within the expected range. The Lenovo ThinkPad Edge E530, which uses the same graphics card, achieved a similar score. Other notebooks using the older Nvidia GeForce GT 540M, which is based on the same chip and Fermi architecture as the GT 630M, were also comparable in 3DMark06. On the other hand, the optional Nvidia GeForce GT 640M is based on the newer Kepler architecture and is fabricated based on a 28-nanometer process. 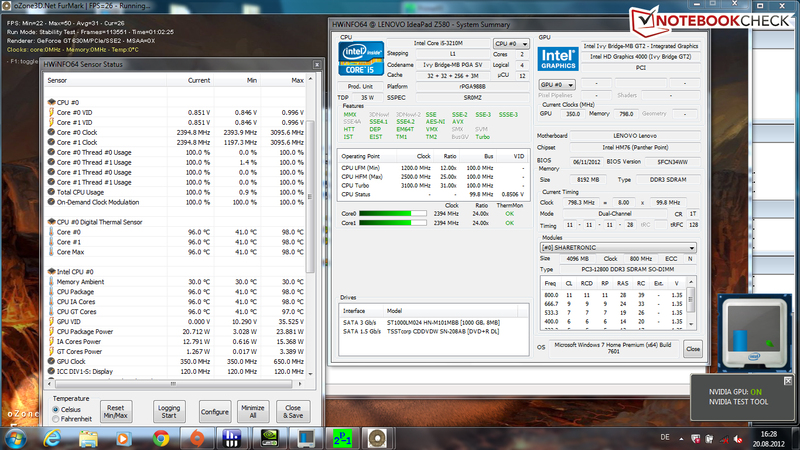 By comparison, the GT 640M found in the MSI CX70 scored 12545 points representing a significant increase of 58 percent. However, the MSI CX70’s quad-core processor and GT 640M configuration would require a price increase of approximately 180 Euro (~$225). Tests performed using the 3DMark11 benchmark suite confirmed earlier results. The IdeaPad Z580’s Nvidia GeForce GT 630M is generally considered a member of the lower-middle class and is not particularly suitable for the latest games at high resolutions. However, casual gamers may certainly consider this graphics card. In addition to our extensive database, we played three games on the IdeaPad Z580 and used our standardized testing procedures. Most games could be played smoothly at the screen’s native 1366x768 resolution. One such example was Diablo 3 in which the IdeaPad Z580 managed a good frame rate of 56 fps in high settings. By comparison, the Intel HD Graphics 4000 only managed an average of 21 fps, a reduction of 62.5 percent. 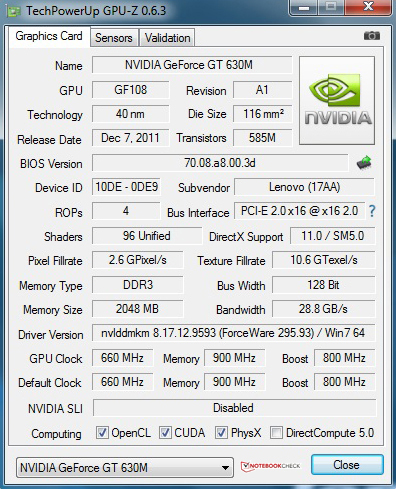 The Nvidia GeForce GT 640M achieved a result of 65 fps in the same scenario, resulting in a 16 percent improvement. 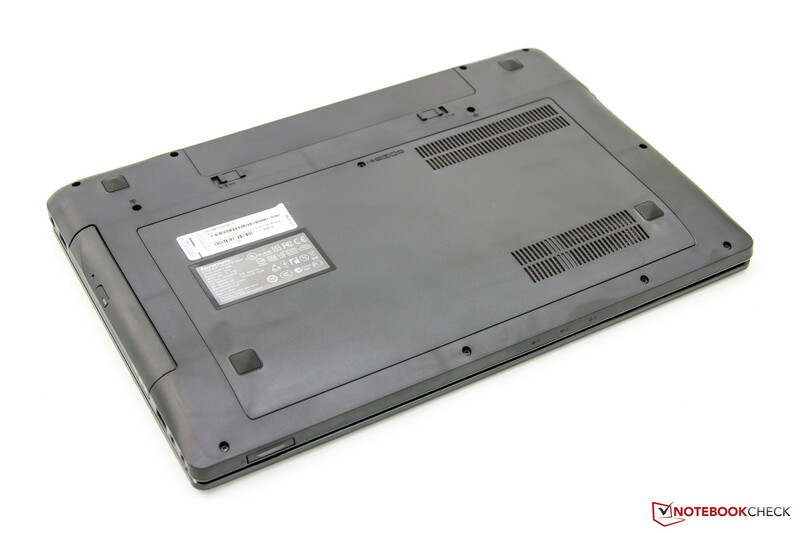 The IdeaPad Z580’s primary sources of noise were its physical hard drive and case fan. During office use, the Z580 was not particularly silent but still decent with noise levels of 33.6 to 34.7 dB(A). This level is also acceptable for use during lectures in university and work settings. 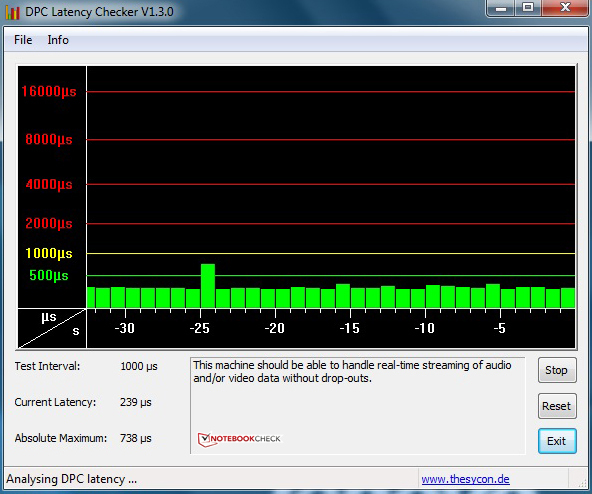 Under load or when playing a DVD, the notebook was easily noticeable with a measured peak noise level of 41.1 dB(A). However, the noise was not entirely problematic due to its low frequency range and quick drop-off rate after load was reduced. 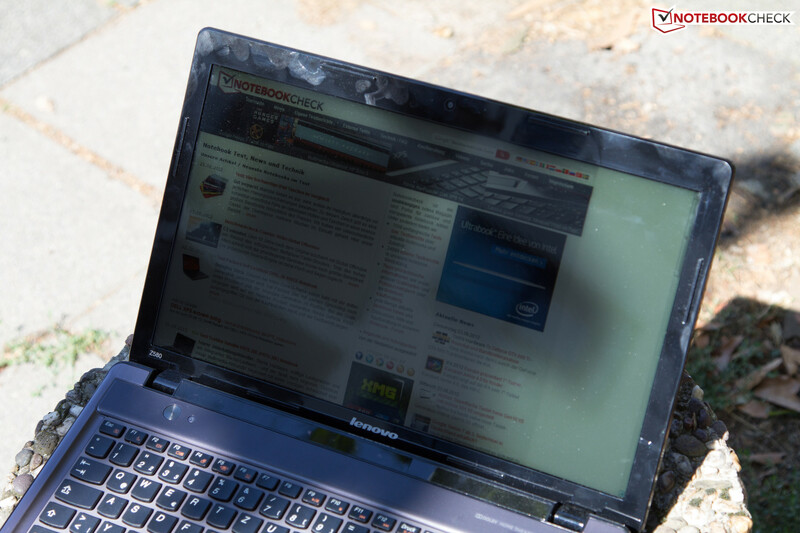 The IdeaPad Z580 demonstrated temperature issues, especially outdoors during the summer. During our measurements, ambient temperatures were between 24 and 25 degrees Celsius (75 and 77 degrees Fahrenheit). While idle, the notebook’s temperatures were consistently in the acceptable range as shown in the following figures. However, the maximum temperature of 33.6 degrees Celsius (92.5 degrees Fahrenheit) on the underside was noticeable even while idle. During the load test, the system’s temperatures increased significantly. We measured a maximum temperature of 47.8 degrees Celsius (118.0 degrees Fahrenheit) on the underside near the fan. The comparison chart below also shows that most of the heat-generating components and the cooling system are installed on the left side of the IdeaPad Z580. On the right side, the notebook stayed consistently cool (blue on the heat map). On the other hand, the wrist rest and touchpad warmed up noticeably on the left side. A more efficient and possibly rear-facing cooling system would have been more desirable. Another common heat-related issue is throttling. We are always concerned with whether full performance is available under load or if heat problems cause a general system slowdown. To answer this question, we use our simultaneous Futuremark and Prime95 load test for one hour. 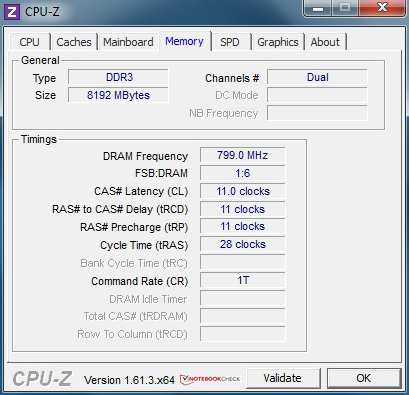 During this test, the CPU of the IdeaPad Z580 reached a temperature of 98 degrees Celsius (208 degrees Fahrenheit) which did not cause a thermal shutdown but the CPU’s clock speed settled at 2.4 GHz during dual-core operation. During subsequent execution of Cinebench R11.5 and 3DMark06, Turbo Boost responded normally. In terms of gaming, we were able to reproduce this slowdown which limited the CPU to 2.4 GHz and 2.5 GHz operation while playing Battlefield 3. This suggests a limitation in the BIOS similar to that of the Dell XPS 14 Ultrabook which had a similar problem. In the case of the XPS 14, updating the bios was very helpful. 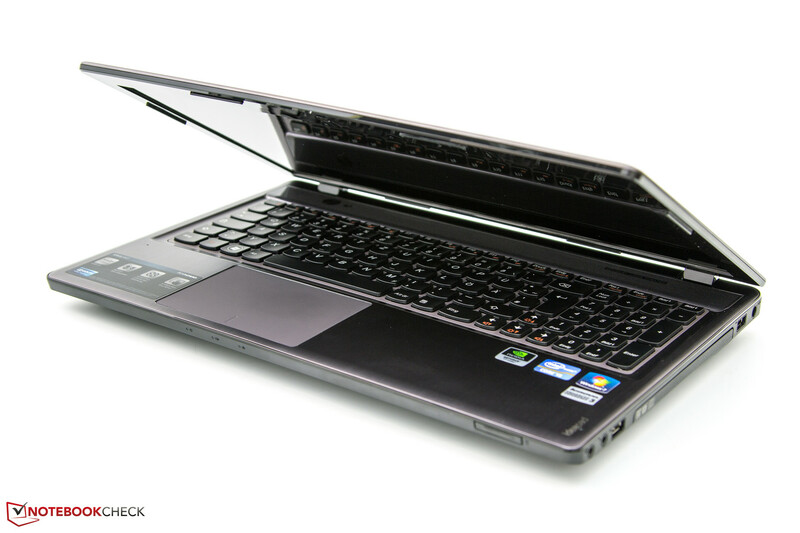 The IdeaPad Z580 includes two stereo speakers with a rated output of two Watts each. Found above the keyboard, the speakers promise a “sharp sound system”. 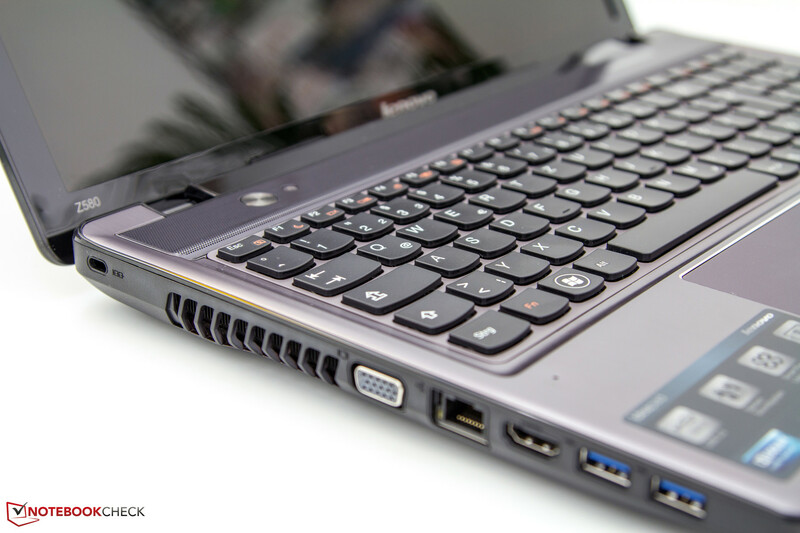 After our testing, we concluded that the IdeaPad Z580 is a multimedia notebook and its sound system is qualified for the responsibilities associated with such a purpose. Subjectively, the bass could have been a bit more emphasized. 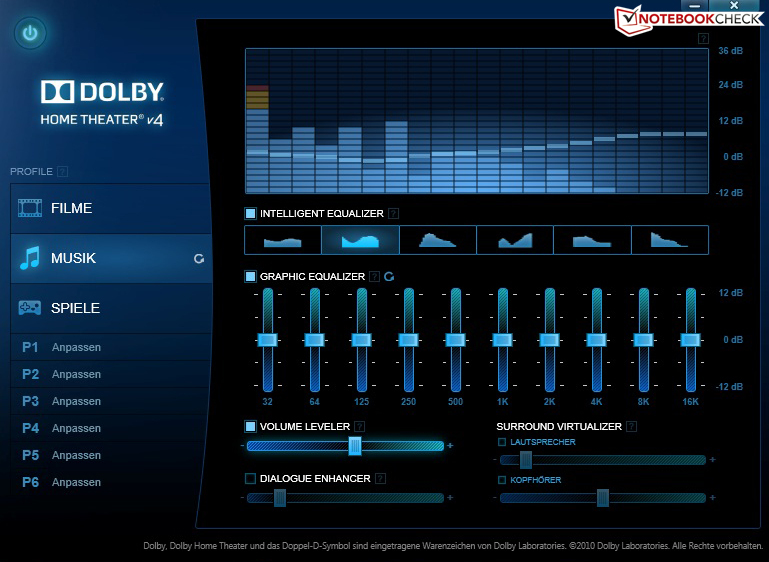 The pre-installed Dolby Home Theater v4 software is worth taking a look as it allows for various settings and custom profiles. Other playback options are possible using the built-in stereo jack and HDMI output. For mobile use, power consumption is an especially critical factor. As a result of the SpeedStep, Turbo Boost, and Nvidia Optimus technologies, the Lenovo IdeaPad Z580 is capable of balancing performance and power efficiency. In office use, the notebook required 10.8 to 15.2 Watts which is typical for notebooks of its configuration and class. Under load, the dedicated graphics card became active and the GPU and CPU power consumption subsequently increased to a maximum consumption of 70.1 Watts. Power consumption during standby mode and while turned off also matched expectations. 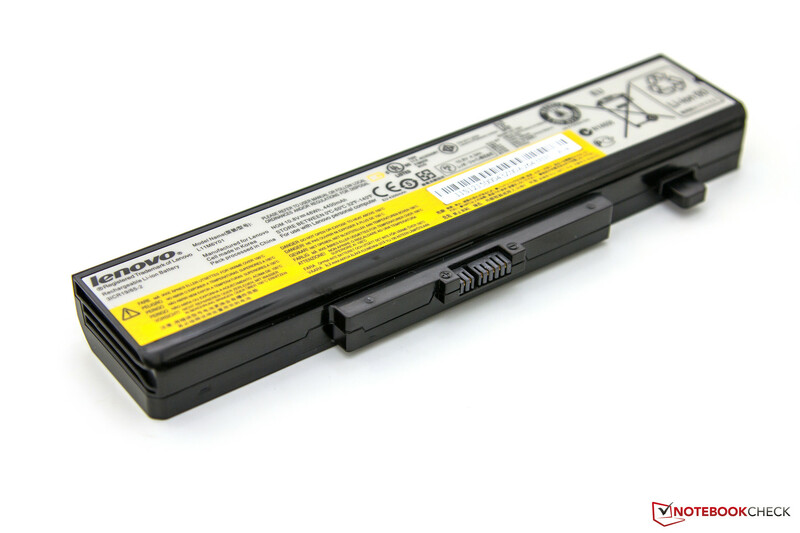 The Lenovo IdeaPad Z580 includes a 6-cell Lithium-ion battery with a rated capacity of 48 Wh. 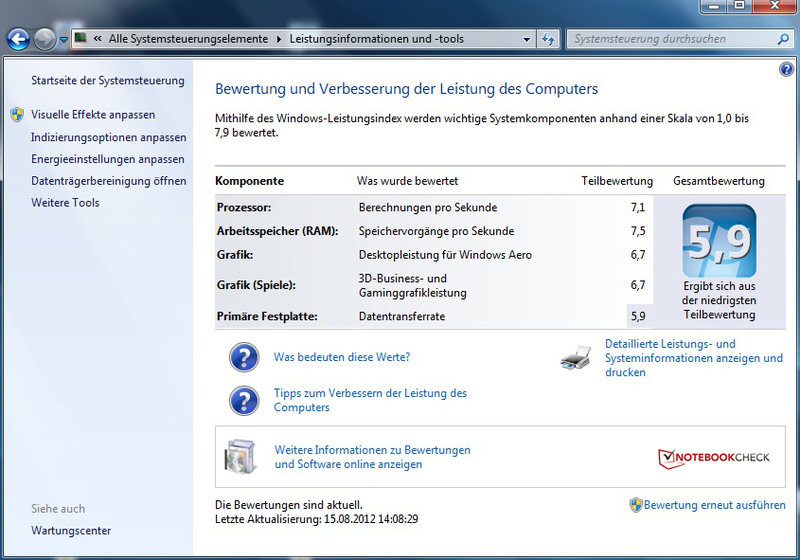 Using the Battery Eater Reader’s Test with minimum display brightness, the Power Saver profile, and wireless modules disabled, the IdeaPad Z580 managed a runtime of 6 hours, 49 minutes. In contrast to this, the Classic Test was used to test the worst case scenario and was conducted with maximum screen brightness, wireless modules enabled, and the High Performance profile selected. In this case, the battery lasted for 1 hour 46 minutes. While Lenovo claimed a battery runtime of up to five hours, they did not specify the conditions of this claim. In order to test a realistic scenario, we used our surfing via Wi-Fi test with a display brightness of approximately 150 cd/m2, Wi-Fi enabled, and the Power Saver profile selected. 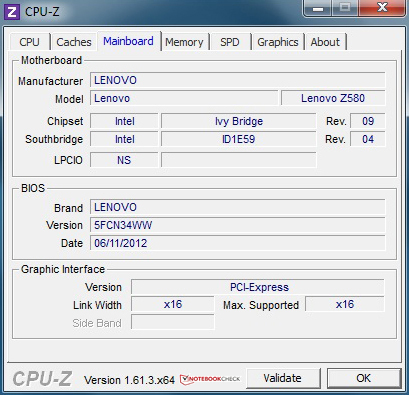 Under these conditions, the IdeaPad Z580 managed a runtime of 4 hours 34 minutes which is close to the claim made by Lenovo. It is possible that Lenovo’s test scenario used an even lower brightness. 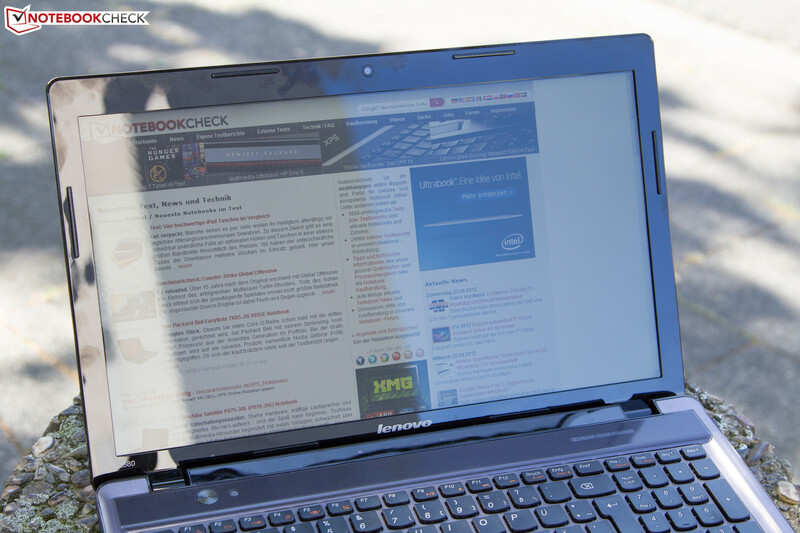 After conducting our review of the Lenovo IdeaPad Z580, we were left with a mixed impression. Some features and functions of the notebook were implemented well while other aspects were addressed with less elegance. The case gave us a nice aesthetic impression but was less convincing in terms of workmanship, haptics, and stability. The components match the current standards but a short 12-month warranty, the lack of Gigabit Ethernet, and the annoying trial virus protection left a negative impression. The input devices gave a good impression but also have room for improvement. The LED-backlit display demonstrated acceptable performance. The measured values and glossy screen did not quite match what one might expect from a multimedia notebook. 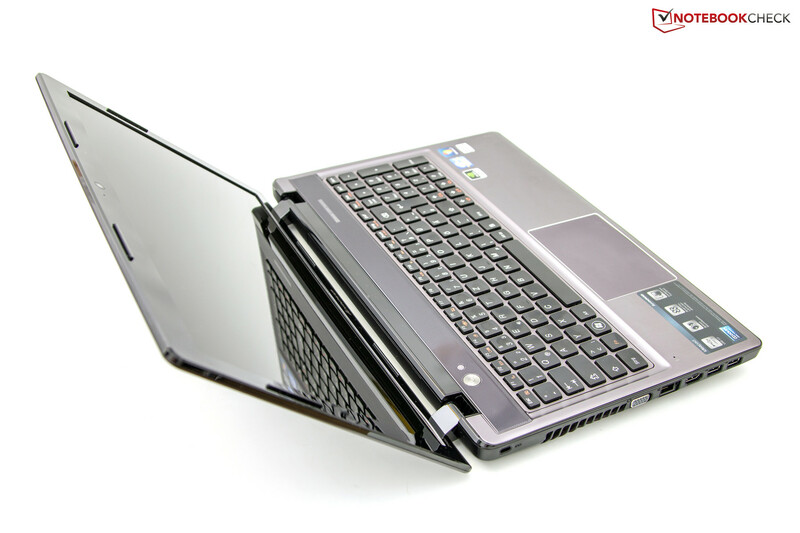 In this regard, the IdeaPad Z580 merely matched the performance of competitors from the same price range. We found the numerous configuration options to be a plus. The dedicated Nvidia GeForce GT 630M allows casual gamers to enjoy gaming on the notebook. Nvidia Optimus and the Intel Core i5-3210M’s SpeedStep and Turbo Boost 2.0 combined to provide a good balance between performance and power efficiency. This is reflected in the power consumption and battery runtime. However, we also felt that heat development under load and fairly rapid throttling of the CPU to 2.4 GHz were points of concern. 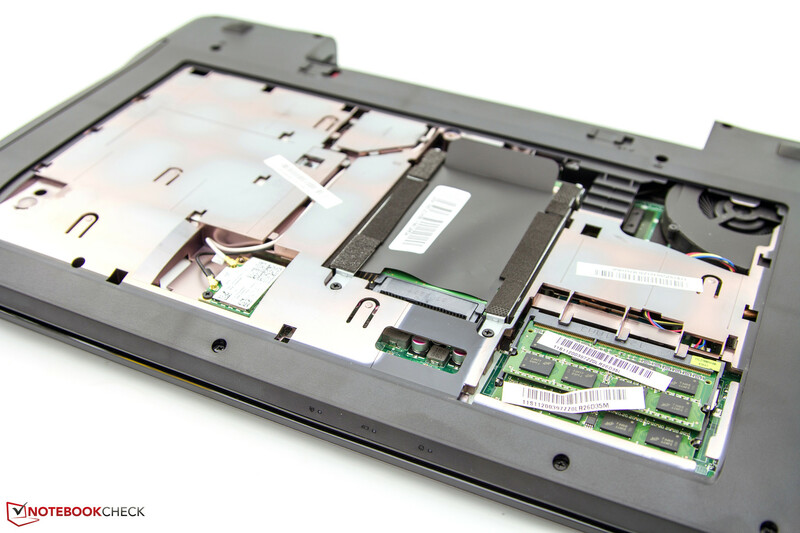 With a more efficient cooling system, the notebook’s full potential could have been reached. While there were positive aspects of the notebook, there were also many negative traits. This resulted in a score of only 80 percent. For 699 Euro (~$875), the IdeaPad Z580 offers a solid notebook for a less-than-demanding consumer. We consider this notebook to be comparable to other notebooks from its class and price range. 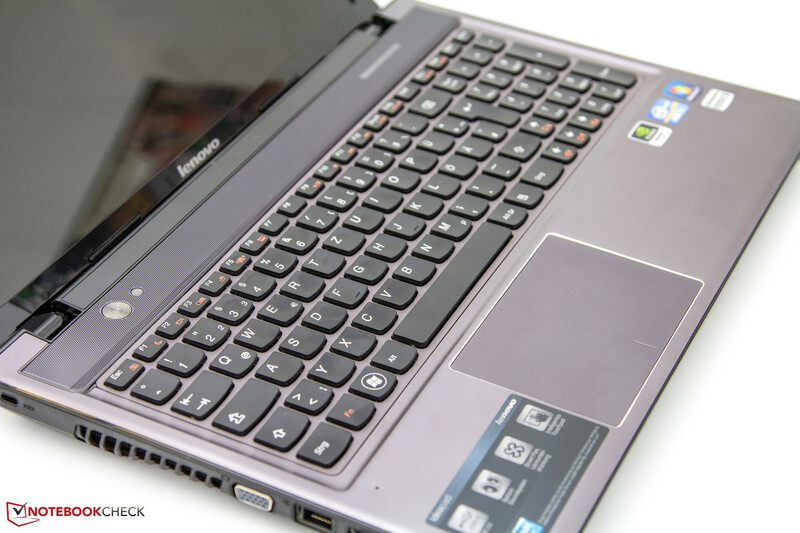 In this article, we review the Lenovo IdeaPad Z580. 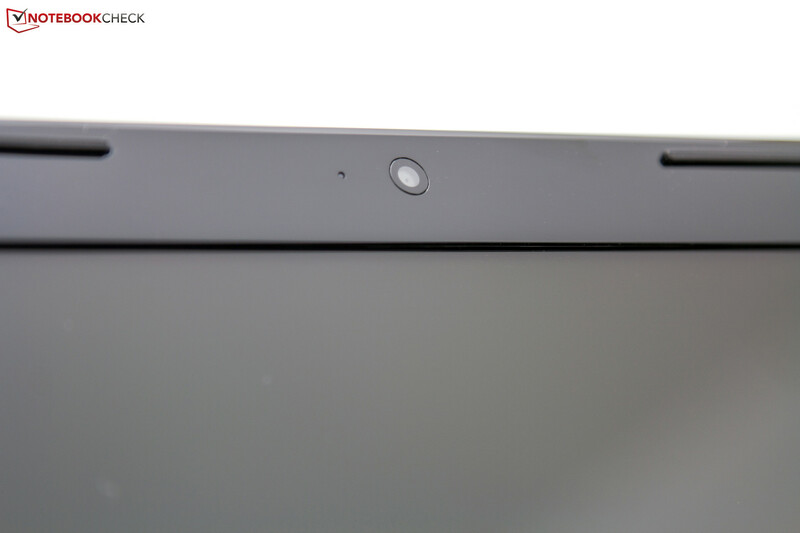 The integrated webcam allows easy video calls in 720p. After removing a screw, the internal components are revealed. 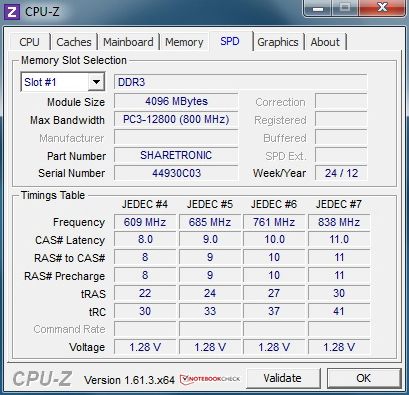 The Z580 includes 8 GB of DDR3 RAM from Sharetronic. The 1 TB Momentus Spinpoint M8 provides more than enough storage capacity. Radio transmissions are handled by the Intel Centrino Wireless-N 2200 module. The small case fan is unfortunately only partially accessible. The opening for exhaust heat is sufficiently large. 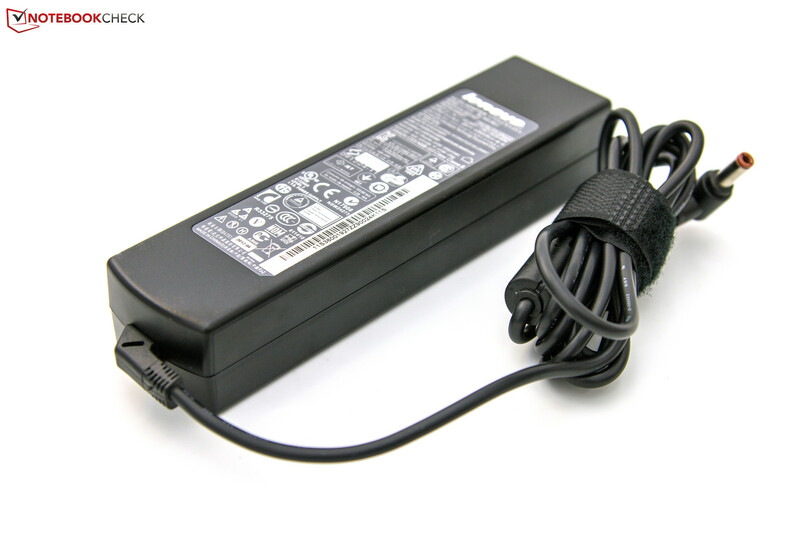 Not a gold brick, the power supply has an unusual elongated shape. The glossy surface is not intended for outdoor use. The sound system delivers good, but not great, sound. 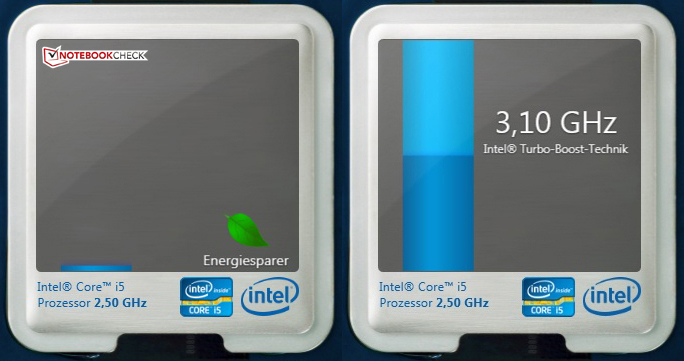 Intel Core i5-3210M CPU and Nvidia GeForce GT 630M. A simple plastic case with no special features. The build quality is fine, but the stability could be better. A large maintenance cover delights editors and users. HDMI and USB 3.0 are standards of this class. The Z580 can be configured with a Blu-ray drive. On the front part of the case is the 5-in-1 card reader. The known AccuType keyboard and a large touchpad. There are two stereo speakers above the keyboard. The good performance of the multimedia components, the simple expansion and the various models. Better positioning of the interfaces, a more efficient cooling system under load and a high quality screen. 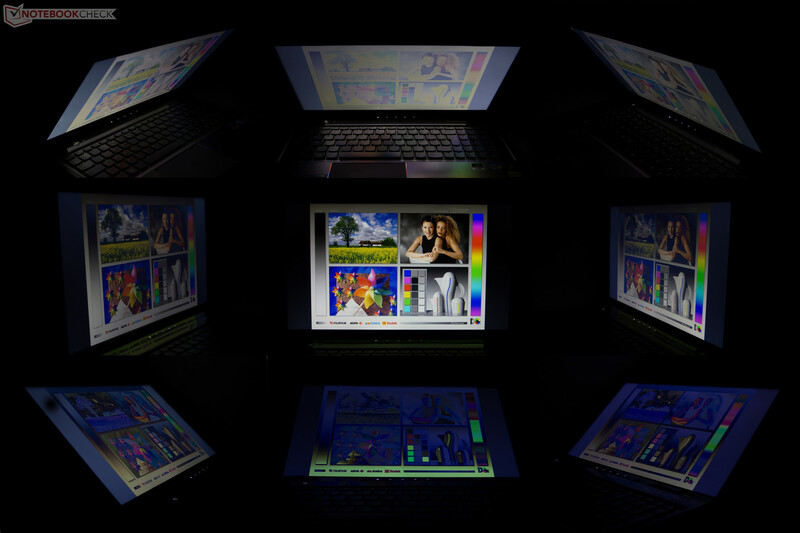 The basic concept of a good multimedia notebook for different needs. Unfortunately, the 'wow' factor is missing from this machine.